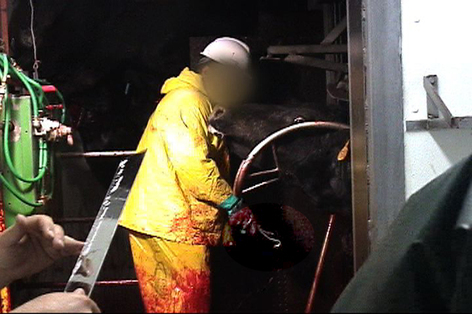 Screen shots from the new PETA video of slaughter in Rubashkin's Agriprocessors Local Pride plant in Gordon, Nebraska. 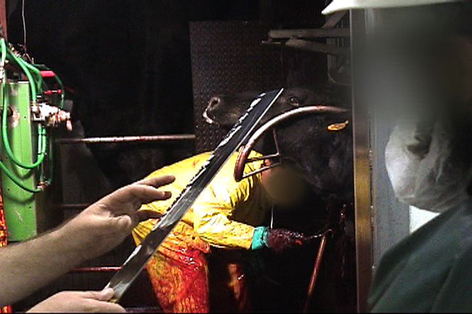 The top picture is later in the sequence, the bottom a few frames earlier, showing a clean meat hook just before insertion into the animal's neck. Please click to enlarge. "It is not a meat hook! It is not a meat hook!" –Rabbi Seth Mandel, head of shechita for the OU. "It is a meat hook!" –Dr. Temple Grandin, noted animal welfare and slaughter expert. Truth-telling is not one of Rabbi Seth Mandel's strong points.